Most of our in-stock cement tile comes in 8" x 8" (20 cm), and several other sizes are available as custom tile. Check on the page that shows a tile's details to see what size it is. The solids can be ordered in many sizes including trim pieces and stair treads. Sometimes it is easiest to figure out how many tiles to order if you calculate your floor's measurements in inches. Multiply the number of feet by 12 inches per foot. Then divide the number of inches by 10 or 8 for 10" or 8" tile. That figure equals the number of tiles in that direction. Do the same for the other dimension of the room. Multiply the number of tiles for length by the number of tiles for the width to get the total to order. We suggest that you order at least 10%-15% extra for edge cuts, breakage, etc. Our tiles are meant to be laid very close together, so just ignore the grout space for the purpose of figuring out how many to order. If your room has a closet, we recommend that you continue your tiles into the closet floor. If you are using a single-color border, you can carry the single-color tile into the closet for a significant cost savings. For rooms with a pattern and a border you will need to measure a little differently. We can help with that as well. Decide if you want your 'rug' design to be centered in your room, or how you want it placed. Try to divide your room in rectangles if it has an irregular shape. To calculate how many tiles you need based on square footage of the space, use these multipliers to see how many tile to order. 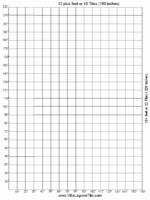 We've put together specially-marked graph paper, with measurements for 8" and 10" tiles. You can download and print the PDF pages to plan your layout. It looks great to use solid color tiles on the outsides of your patterned central feature. You can then trim the solids as necessary to fit in the space between the central 'rug' part of the floor and no one will notice if the solids are slightly wider or more narrow on one side or the other. When your installer lays your tiles, he or she needs to start from the center of the room but they will know that. Just give them your diagram and our installation guide, so you know that everyone is "on the same page"...take nothing for granted when it comes to the workers understanding your intent.